Bulk zippered shopping totes with large 6 in. gussets and bottom panels, custom imprinted or blank (not imprinted). Our wholesale shopping tote bags are made of 110 Gram, Non-Woven, Coated, Water Resistant Polypropylene, with the feel of cotton fabric. 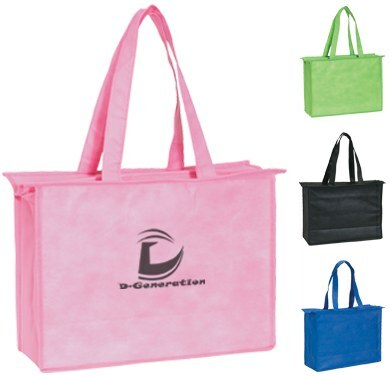 The very top of the line for shopping tote bags: 50% thicker and sturdier than most other non-woven shopping totes. Budget Prices in the USA for bulk zippered tote bags. Free artwork design. We will send you a proof for your approval before production. American clients pay no taxes. The basic unit prices below include your 1-color imprint on one side, or they are for blank (not imprinted) shopping totes. Add $0.50 per shopping tote for each extra imprint color, per side. Production Time: 7-10 days after art approval; contact us for faster delivery. Blank zippered shopping totes ship next day. BAG SIZE: 15 3/4" W x 12" H x 6" D (6" gusset). COLORS: Black, Pink, Royal Blue or Lime Green. PACKAGING: 100 per carton @ 29 lbs.